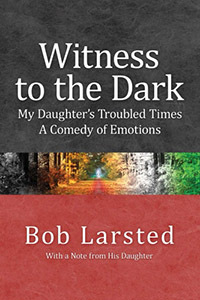 Entry Title: Witness to the Dark: My Daughter’s Troubled Times. A Comedy of Emotions. This is a very candid and carefully crafted look at the author’s young daughter as she struggles with a number of mental challenges. The author’s background as an engineer is both an asset and a parallel here; his skills at problem-solving as an engineer act as a mirror of his attempts to find professional help for his daughter as she struggles with suicidal impulses, depression, and other phobias. It is a no-holds-barred narrative without being overly dramatic. In addition, the volume carefully documents (as an engineer would do) the discovery process of finding the right help as the daughter’s needs change and as she ages. There are sample questionnaires, checklists, prompts, and questions that the author encountered as the guardi[an] and parent. Thus the volume proves instructive as well as informative all while sharing very candid and honest details about one family’s journey with mental illness. The author uses a clear writing style (again, as one might expect from an engineer’s orderly mind), but he also uses repetition and short, dramatic sentences as a way of building tension, releasing tension and pacing the work. For traditionalists, this abundant use of sentence fragments might seem too bumpy; others will find it effective. The cover is eye-catching but not clearly connected. The subhead, “My Daughter’s Troubled Times. A Comedy of Emotions,” seems off kilter in that there is very little humor attempted here. In fact, the earnest tone is one of the volume’s assets. If that is meant as a satirical statement, it’s not clear. This entry was posted in Book, Muted and tagged book, reviews. Bookmark the permalink.